OMD! Petco boxed up Halloween and shipped it to me! I'm so excited! There is so much to bark about! What do I want to bark about first? 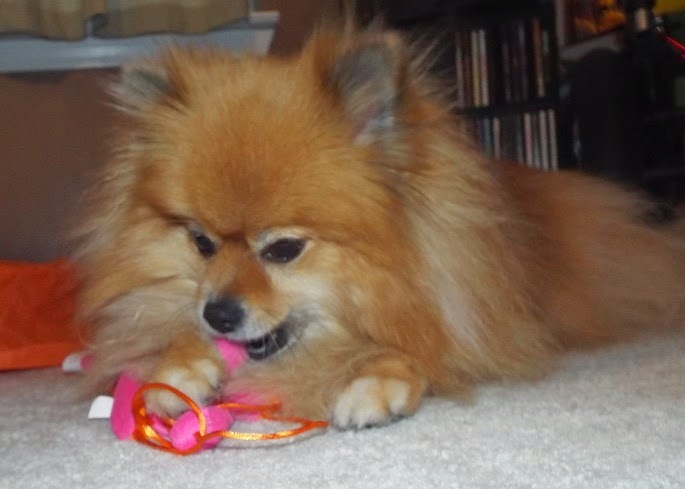 Naturally the first thing that caught my Pommie attention was a cat toy. BOL! There's no escape from the Pommie death grip! This Prancing Prey Puppet Teaser cat toy by Leaps & Bounds will beg for mercy! 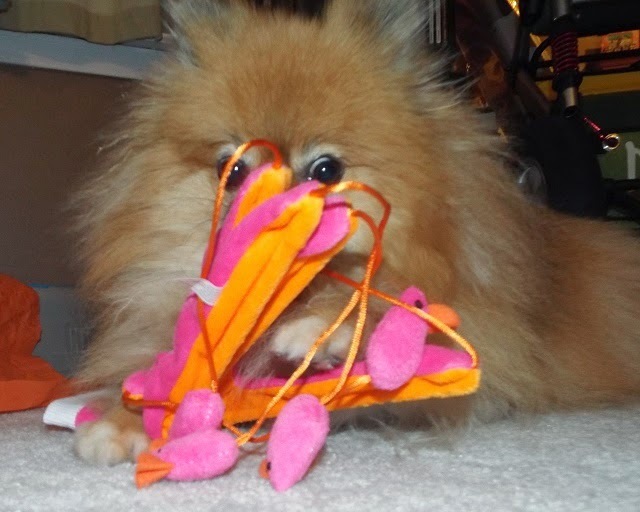 The minute I saw this pink plush toy, I snatched it out of the Halloween pile. It is really a glove meant to be worn by a human hand and wiggled to tease a cat into swatting at the mice. Each finger has a cord with a mouse attached to it. Who's your pumpkin? 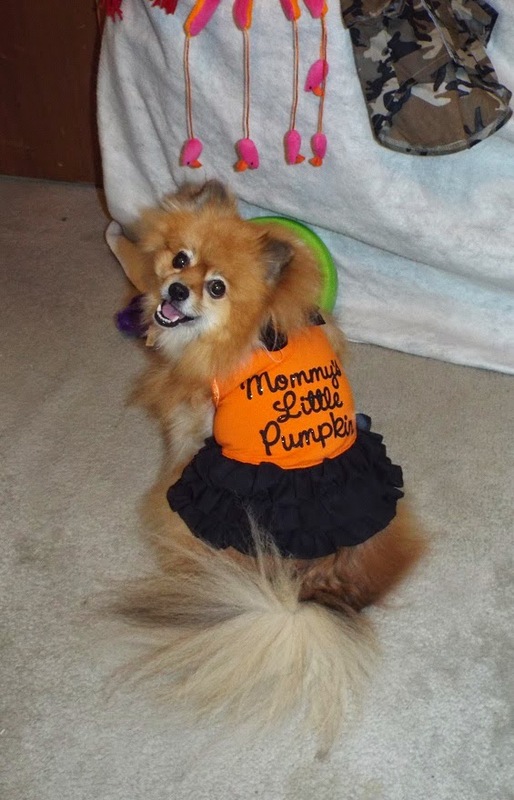 Mom couldn't wait to get me into the cute Little Pumpkin dress. It has a glittery pumpkin on the bow at the back of the neck, and fun chiffon ruffles on the hem. 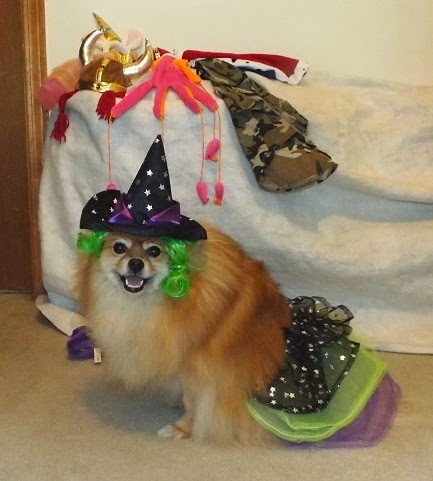 I decided to ask my pal Oz to help model the next outfit. "Hey Pep, check me out! I am ready for the next zombie outbreak with this new costume from Petco. I am Oz the Zombie Hunter. Pretty tough looking, huh? 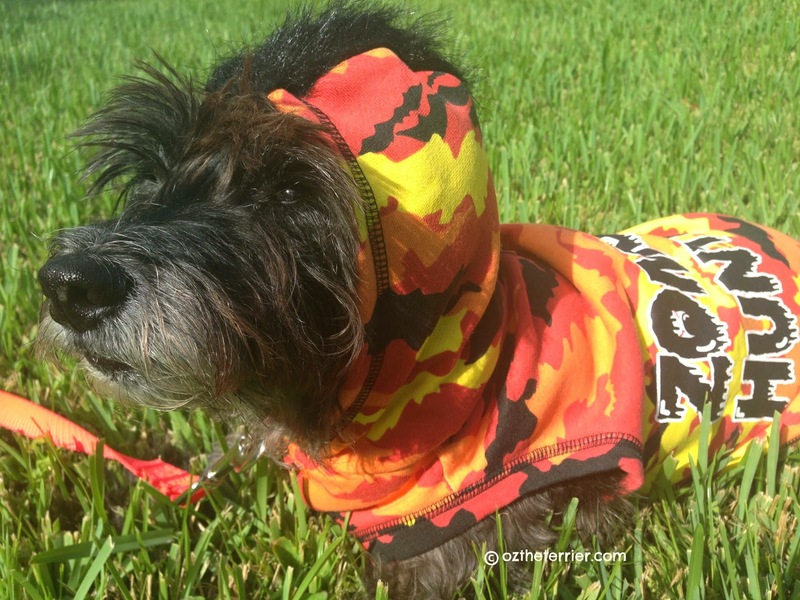 Check out the mohawk that this cool hoodie gives me. 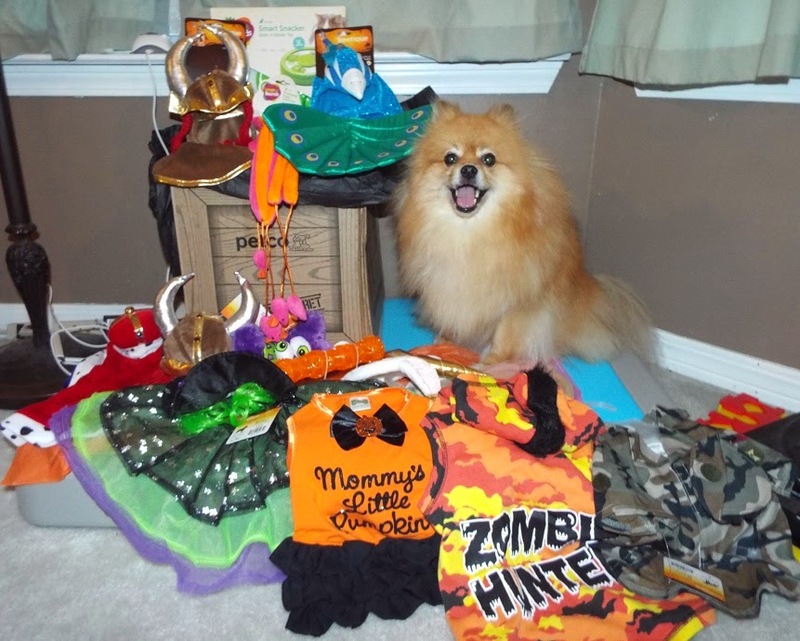 Zombies beware; I am a lean, mean Zombie Hunting machine!" BOO! This bone is mine! 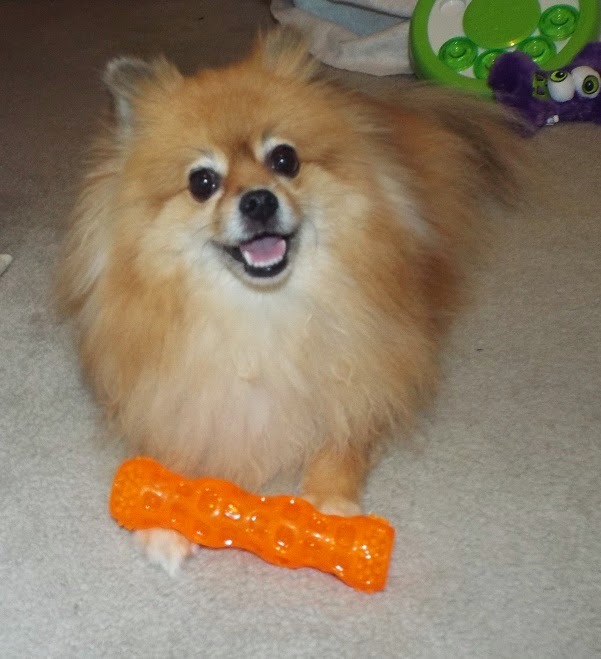 It has puffy eyes and a squeaker. It is the pawfect size for me to fetch. 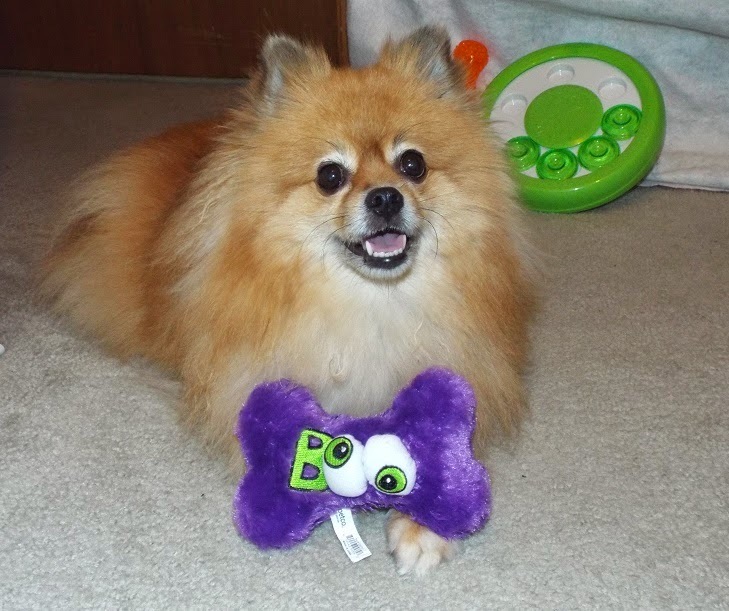 Petco has so many fun toys! When cousin Bailey joined the USArfy as Private Rover, she was hoping for kitchen patrol, instead she ended up with latrine duty. BOL! This uniform has velcro closure in the front, and decorative shoulder patch details to look like a real arfy uniform. 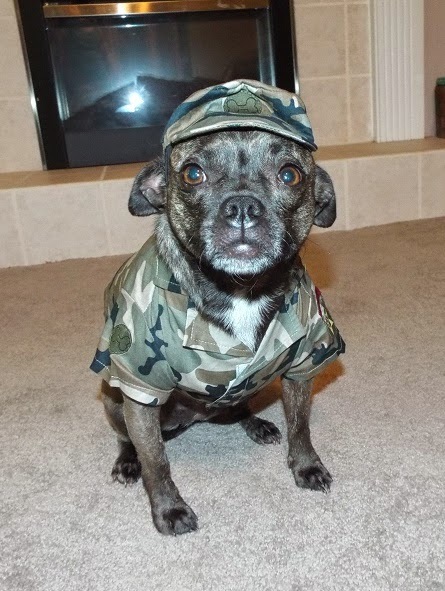 In this uniform, your furry little soldier will be ready for guard duty on Halloween night. OMD! It has blinky lights and a squeaky! This light up rubber stick is a furrific Halloween toy. The lights inside blink whenever the stick bounces after your human throws it. Your human won't need to remember to turn the lights off because they automatically turn off. Cousin Amanda thinks that being a Brave Viking is cool! 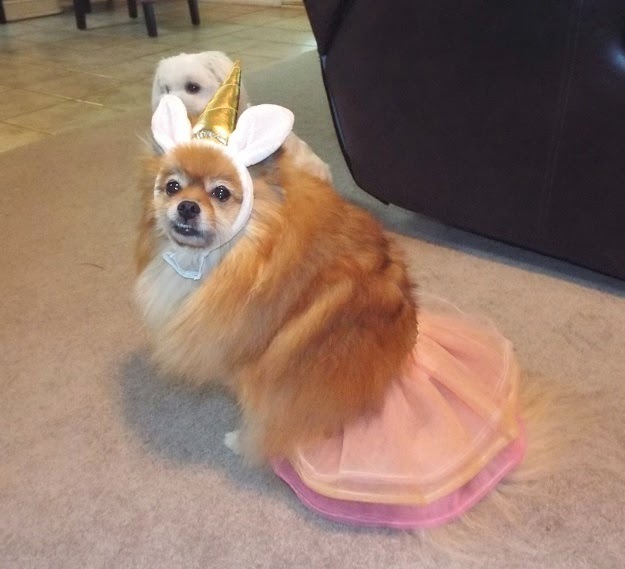 This costume can fit many different size dogs because it is a hat (adjustable elastic strap) without a bodysuit. The plush headpiece & horns are filled with stuffing inside to keep them standing up. The helmet is decorated with pretty amber colored stones. 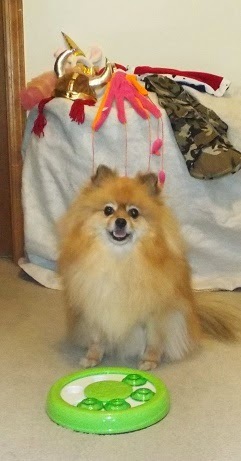 Cousin Bailey barks back "Amanda may be a Brave Viking, but I am the King of Barks! (Yes, girls can be kings too. Specially when it involves barking. BOL!)" This costume has 3 pieces: shirt, cape, and crown. The jeweled crown is filled like the same as the viking helmet to make it stand up the way a king's crown should. The shirt has a velcro closure in back which is concealed once the cape is put on. Wonderpurr Halloween Costumes from Petco! It’s that time of year again when pawrents shop at Petco for holiday giggles and photo ops. 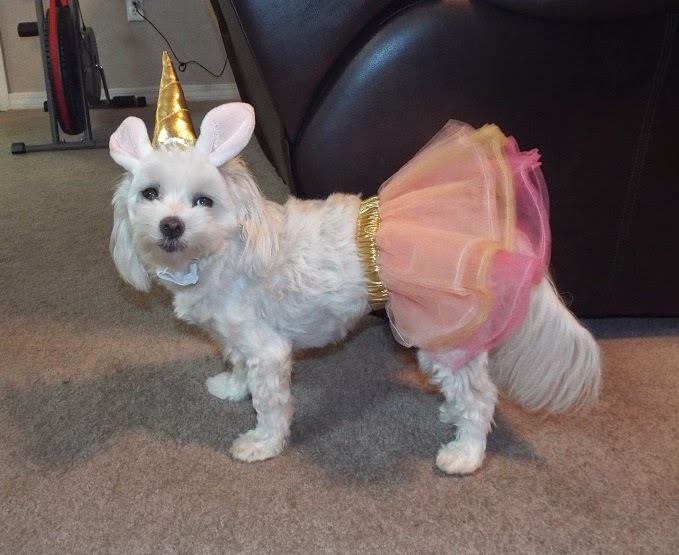 I’m talking about Halloween costumes made for us, their fur kids. You know how I love attention, and modeling a peacock costume called Feathered & Fabulous gave me a lot of it. Of course I also had to suffer unwanted attention from that one-eyed pawpawrazzi monster my mom calls a Nikon. But I made her smile by letting her dress me up, so it was worth it. The peacock headpiece is exceptionally well-made with slits so my ears are comfortapurr while I wear it. And the Velcro strap adjusted to fit snug, and comfy, under my chin. The glitzy costume body fits comfortably with one Velcro strap around my neck and another under my arm pits. I had no problem at all wearing it or walking around while Mom had her fun. The tail feathers are one piece with stiff padding so they will stand up when your kitty struts with his own tail held high. 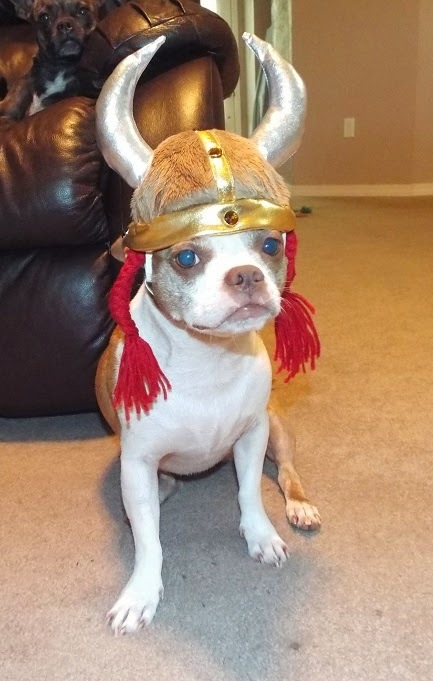 My brofur, Opie, volunteered to model the Viking Warrior costume by Petco. The helmet headpiece has a soft furry cap trimmed with a satin-finish gold band dotted with sewn-on brown rhinestones. It fit snug under his chin with a Velcro strap. 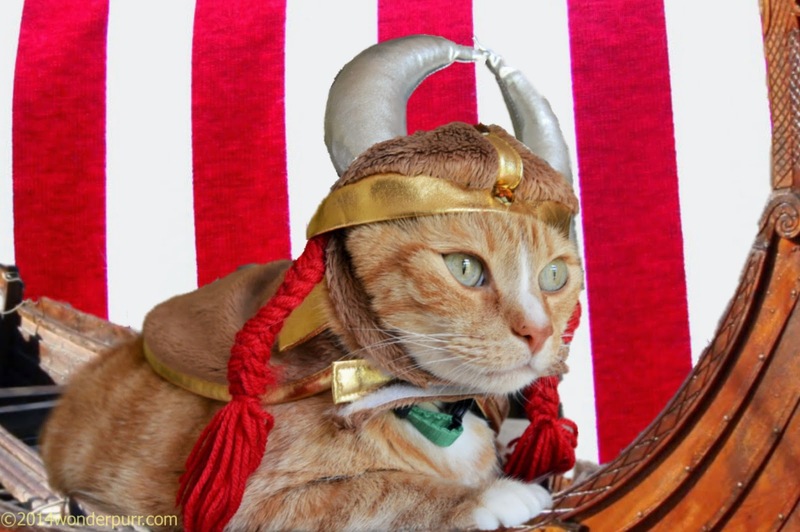 The pawsome horns were padded but light so Opie said he didn’t feel like he had weight on his head. The piece also had ear slits but Opie thought they detracted from the glorious red braids attached to the helmet. The cape is like the Viking helmet, made of soft and light furry material trimmed with a gold satin band lining the cape, extra thick at the collar with a Velcro strap to keep it in place around the neck. What do you mean it would look better on Baron than on me? Okay, I realize it's not really my size, but it has a pink tutu! Unicorns are white? Are you sure you've never seen an orange Unicorn? Oh yummy! I love treat puzzles! 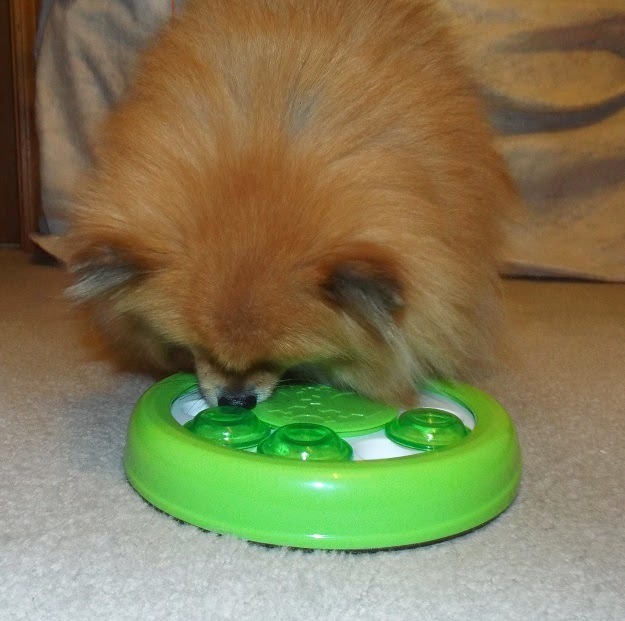 The Leaps & Bounds Smart Snacker Slide 'n Nibble cat toy is great puzzle toy. It is simple enough for dog puzzle beginners to solve. It has 6 holes and 4 sliding covers. You won't lose the covers because they aren't removable. You push the covers around the ring to reach the treats (or kibble) in the holes. The box says to move the covers with your paws. I think that is how cats would solve the puzzle. Cousin Bailey and I used our noses, but we are dogs. BOL! This is a great way to challenge cats and introduce (small to medium size) dogs to puzzle toys. It makes your pet think, but isn't so difficult that they get discouraged. Note: Your dog or cat has to want what is in the holes to be motivated into working at any puzzle. I don't care that the box says "for cats", it gave me treats and I'm keeping it! Excuse you, what did you call me? You'd better be careful or I'll put a paw spell on you! Oh, you meant the good kind of witch. BOL! 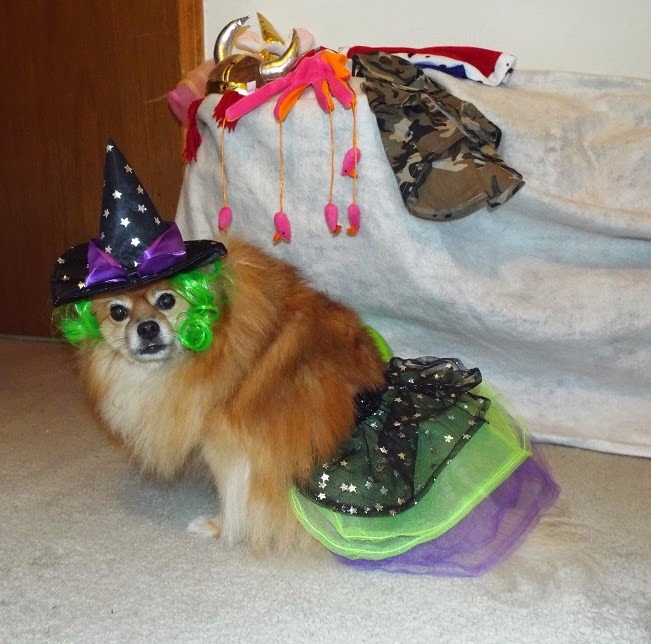 I am cool and comfortable in this Starry Witch costume. The lightweight tutu is pawfect for me to wear in the warm weather we have down here. I can look cute during trick or treat without needing to worry about overheating. 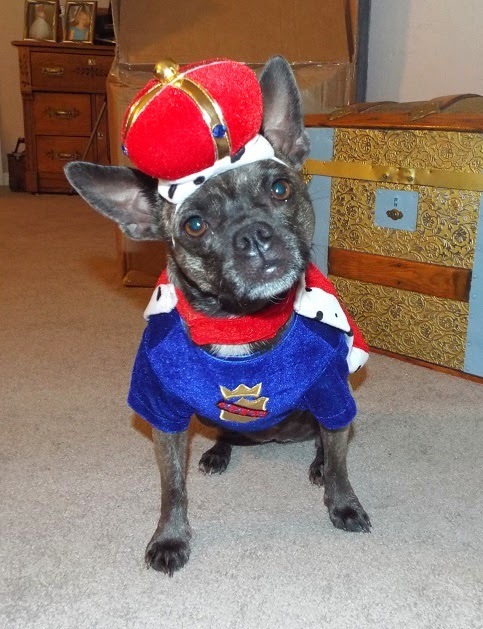 From costumes to toys, shopping at Petco is a Halloween treat for everyfur! OMD that is so much awesome stuff! We don't really have a Petco close, so it's not a store that I get to really shop around in. Maybe I'll have to get Momma to dig around on their website! Oh boy! What a fun day of playing dress up! How will you EVER choose which costume to wear this Halloween? Pepper! You put on a pawsome fashion show! Thanks for letting me and my brofur, Opie, join the fun! As always, you're wonderpurr!